Today, September 22, the sun shines directly on earth's equator and the length of the day and the night are nearly equal. It is the Autumnal Equinox. This quilt is Colors of the Sun—a quilt I made in 2001. This was one of my first attempts at drafting a paper piecing pattern [needed for the suns] and the quilt was in response to my first Guild Challenge. It's also one of my husband's favorite quilts. 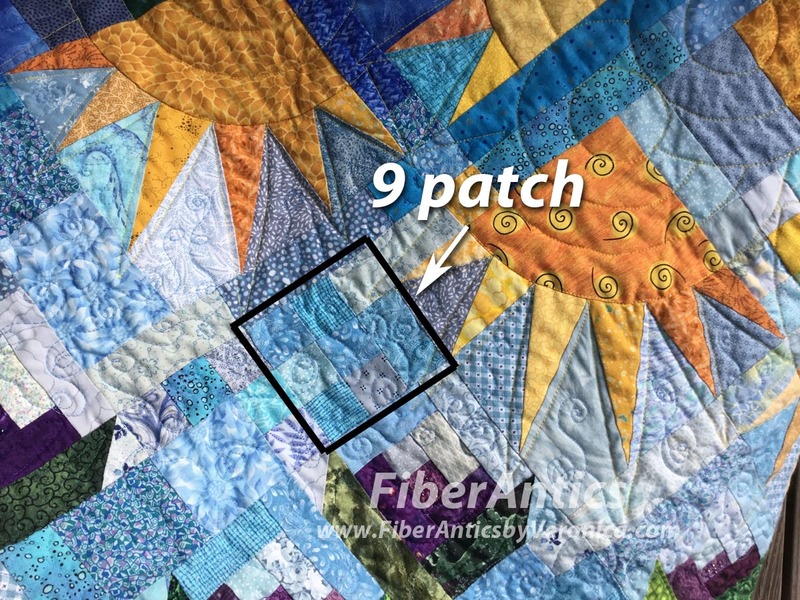 There are several scrappy 9-patch blocks incorporated into the quilt. 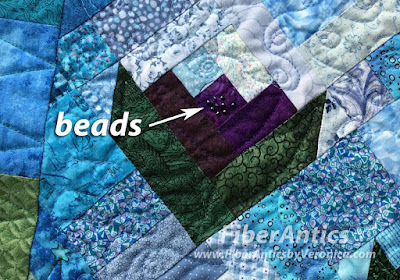 These are the most obscure of the required elements in my quilt. The 9-patches are 3" finished so the individual units are 1" each. 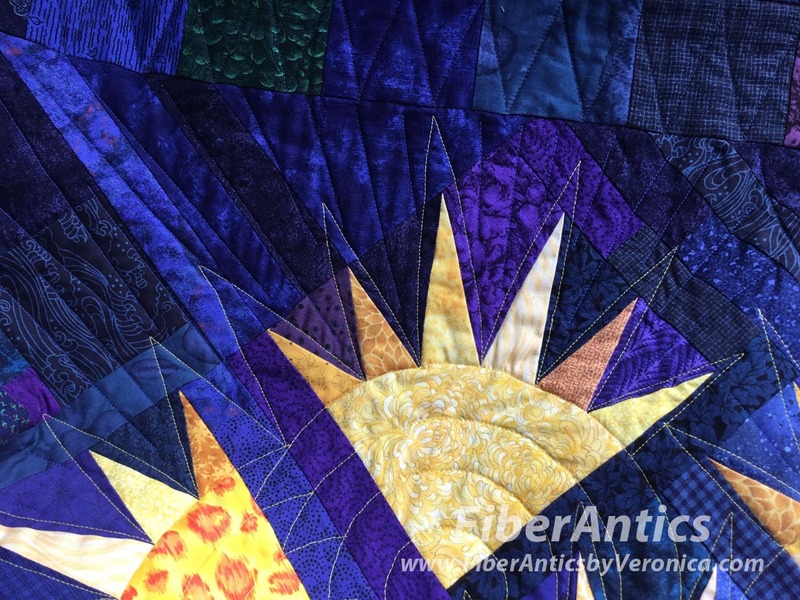 The 9-patch, sun, log cabin, yellow, green and purple elements can be seen here. The quilt has free-motion and walking foot quilted. This was way before ruler work tools were available for domestic sewing machine quilting (and my free-motion skills were not quite developed). Walking foot quilting around the suns and in the border. The tops of the "log cabin" flowers were embellished with beads. Beading on the flower centers. From today until the winter solstice on December 21 (in the northern hemisphere), our days will shorten as the nights grow longer. 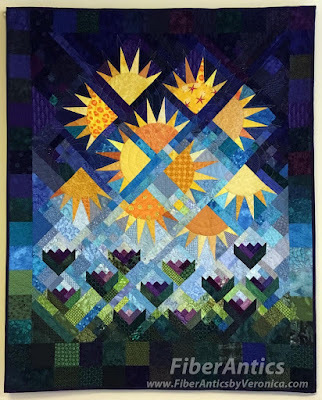 As the cooler temperatures approach, it's a great time to rummage through your fabrics, decide on a new or pending quilting project and put needle and thread to stitch. I love being involved with the art of quiltmaking in the fall and winter months!